Estimating range to marine mammals is a key skill for Marine Mammal Observers. Range can be estimated using different methods, but described here is how to estimate range using reticle binoculars. Number of mils in each reticle of your binoculars (refer to your binocular specifications). 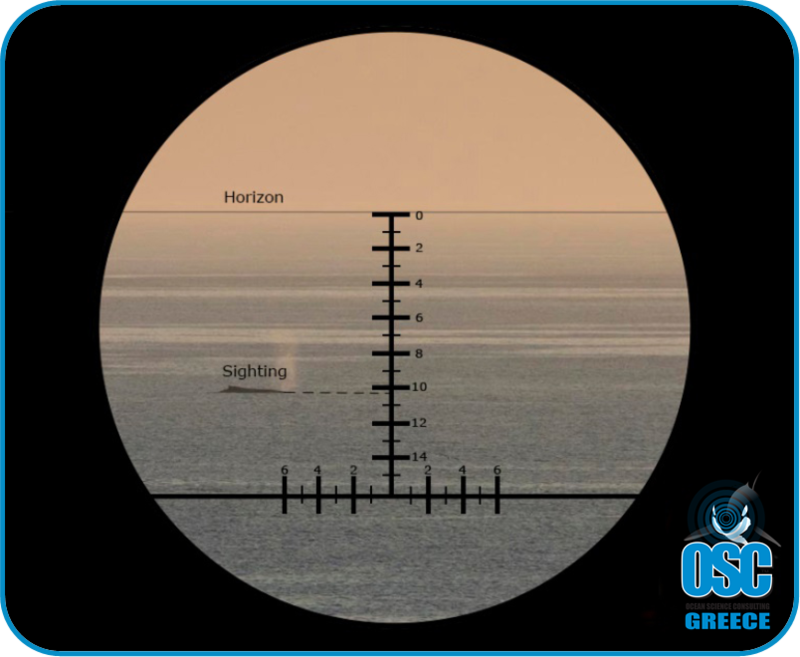 When a sighting occurs, align the top reticle with the horizon, and count down to the animal. Then calculate the number of mils, for example if a marine mammal is sighted at 10 reticles, and each reticle is 5 mils, it would be 50 mils. Range estimation needs to happen quickly in the field, especially with regards to exclusion zones. Therefore, it is advisable to calculate ranges prior to going on effort. This can be done by entering the equation into an Excel™ spreadsheet, and producing a table like the one shown below; a pre-made spreadsheet can be downloaded (in English) here.